Take action with us on September 13th – BP or not BP? Posted on September 4, 2015 by BP or not BP? Join Art Not Oil for a “protest festival” at the British Museum on Sunday September 13th! IMPORTANT FOR ANYONE PLANNING TO COME: Please email festivoil@riseup.net so we can send you more details, and leave yourself lots of time to get into the Museum on the day as there may be long queues. We’re inviting anyone that wants to stand up for human rights, habitat protection and a safer climate to join us for an anti-oil festival inside the BP-sponsored museum. We’ll have a series of stunts, performances and interventions going on throughout the day followed by a mass flashmob finale at 3pm! We already have sixteen different groups and hundreds of people signed up – but we need you too. We just announced the action in the Guardian today, so it is ON. The groups and performers taking action as part of this event include Liberate Tate, BP or not BP?, Dharma Action Network for Climate Engagement, Platform (in solidarity with Azerbaijani prisoners), Divest London, Stop the Arms Fair, London-based Quakers, Los Perros Romanticos, Fossil Free KCL, London Rising Tide, and others. It would be fantastic to have you there too. Please email us on festivoil@riseup.net and we’ll send you all the information you need to take part. This is an important year in the fight against fossil fuels. 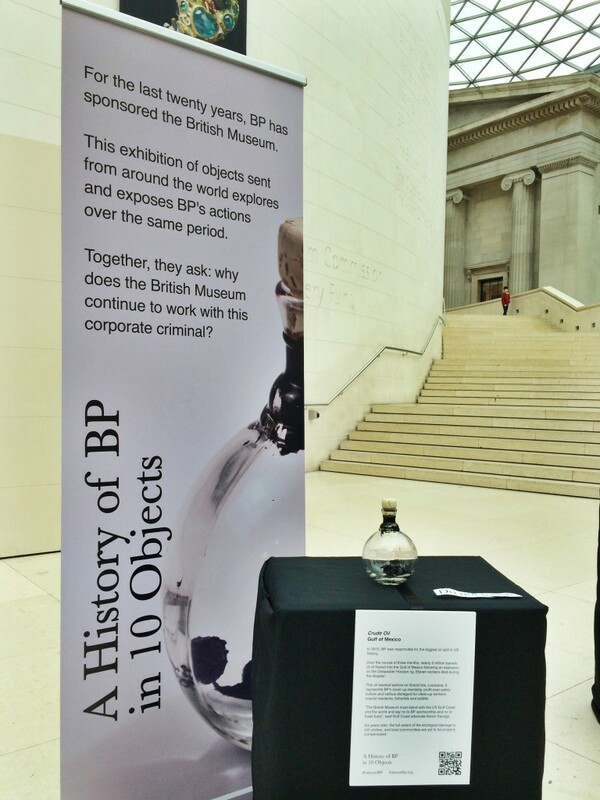 In 2016, the sponsorship deal between BP and four iconic national institutions (the Tate, the British Museum, the Royal Opera House and the National Portrait Gallery) is due to expire. Whether or not those deals are renewed will depend on the amount of pressure that we pile on these institutions in 2015. If we can get even one of these iconic cultural organisations to drop BP, it will be a significant victory in the battle to stigmatise, expose and reduce the power of the fossil fuel industry. That’s why the various groups in the Art Not Oil coalition (Liberate Tate, BP or not BP?, Shell Out Sounds, Platform, BP Out Of Opera, Rising Tide UK, Dharma Action Network for Climate Engagement, UK Tar Sands Network and Science Unstained) have spent the last year intervening in these spaces with flashmobs, pop-up musicals, anti-oil dance routines, theatrical performances and interactive art installations. You can see some of what we’ve done at http://www.artnotoil.org.uk. But it’s time to step things up. This will be the Art Not Oil coalition’s biggest and most ambitious event yet, and we’d love to have you there on September 13th. Just email festivoil@riseup.net to sign up (you can also join the Facebook event but you’ll need to sign up by email to get the most important information). Please also share this message with everyone who might be interested, and invite them all to the Facebook event too!